Foundation Luke Manor was established 26.10.2007. Founding members of the foundation are 13 civilians and Nõo borough. Foundation Luke Manor was created by people with initiative. People, who care about the development of Luke manor came together and decided to work as a team in order to bring the manor back into life. Foundation Luke Manor includes citizens, who are connected with Nõo borough, enterprisers and public figures, who together want to contribute to the preservation of a manor complex for our posterity. 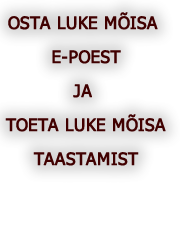 Founding members of the foundation are: Nõo borough, Esta Tamm, Teet Marran, Gea Järvela, Aivar Kuuskvere, Lea Kiivit, Lembit Rebane, Margus Mondonen, Heino Ruul, Tiiu Tootsi, Vello Brett, Eerika Sootla, Tiit Kubri, and Lembit Toru. Gea Järvela, Aivar Kuuskvere, Lea Kiivit, Heino Ruul, Rain Sangernebo. The foundation works on the basis of voluntary action and working assignments have been divided. The foundation has been created keeping in mind public interest for gathering resources, governing property and achieving the goals set in the statute. The foundation acts in accordance with the principals of Estonian civil society code of ethics. Mission of the foundation: to help restore and develop Luke manor complex by using experience and ideas. Purpose of the foundation is to support the development of Luke manor complex and to preserve natural, historical and cultural values. d) Gathering earmarked donations for Luke manor complex development. Luke manor complex is under Nõo borough`s municipal ownership and the manor park is meant for public use. Foundation Luke Manor and Nõo borough have signed a concordat, in which the role of the foundation is torestore Luke manor complex buildings. In order to restore the buildings, the foundation and the borough are entering into rental contracts. The foundation is planning to apply for financial means from European Union’s structural funds. An important aspect in applying money from European Union’s funds is that the restored object will remain in public use after the restoration is completed. In order to coordinate wholesome development of Luke manor complex, a final solution and feasibility analyses has been conducted with the help of experts. It is stipulated in the final solution of Luke manor complex, that the stable will be restored as a visiting center, steward`s house as a cultural center and distillery tenants house as an art center. Luke manor complex is situated in South Estonia, Tartumaa, Nõo borough. The manor is about 25 kilometers from Tartu (on Tartu-Valga road). Luke manor park is one of the best preserved manor parks in South Estonia and is the most valuable element of the manor complex today. Luke manor, it’s a place, where you can leave your heart. Just come here and hear the water flow, admire the beautiful gardener`s house that looks like a doll house, sit in the pavilion and watch the reflection of trees on the water. That way you can picture yourself as one the people who once lived there. Lions, who guard the stone stairs, add majestic feeling and daisies look so incredibly romantic. The park looks most beautiful in the spring, when everything is so green and the water is high, but the park is also beautiful at every season. Luke manor complex is owned by Nõo borough, thereof you are always welcome here. You are allowed to hold a picnic, lie on the grass and swim here. All together, it’s the perfect place for relaxation. The restoration of gardener`s house and the pond system in 2005 was supported by CBC 2002 program and foundation Keskkonnainvesteeringute Keskus. Information desk and an exposition of manors are located in the gardener`s house. Luke manor pavilion and park, which were built in 2006, were co-funded by European Regional Development Fund local social-economical development measures.